A new bride, Jacqueline Cousins was forced to watch her new husband being shot dead by masked gunmen at their Jamaican wedding reception. Jacqueline Cousins, 49, married Dameion Cousins, 31, in an idyllic ceremony in the Caribbean. But hours later an armed gang burst into the reception claiming the groom owned them $10,000 Jamaican dollars - just £60...which is like N15, 500. They held the bride at gunpoint while Mr Cousins was shot in the head outside in the driveway. Mrs Cousins, a family support worker, from Hornsey, North London, said she has no idea why the gang targeted her husband. 'I started screaming and screaming and I could not believe what I was seeing. 'I lay down next to him and I put my head on his chest. I realised he was dead. 'We were just two people who really loved each other and had taken that move to be together and just a few hours later this is what I was dealing with. The mother-of-seven first met Mr Cousins - a songwriter and performer - when she visited her parent's home in Jamaica 11 years ago. The couple did not begin dating until seven years later when her previous marriage fell apart. 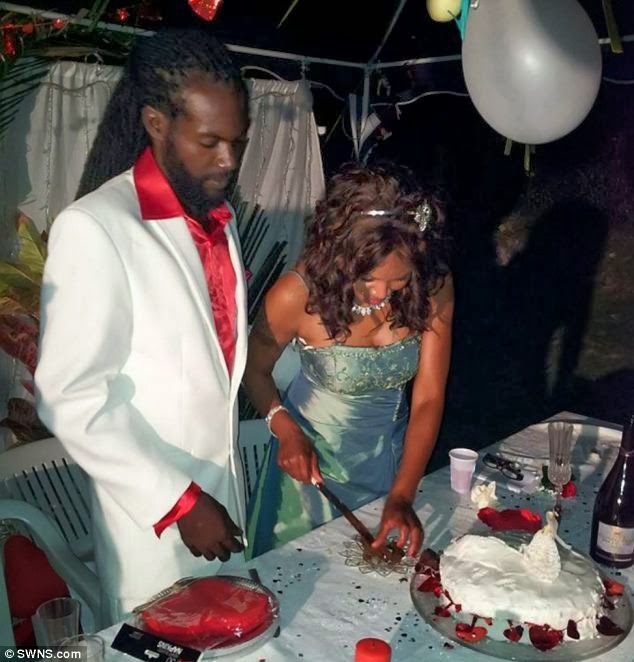 After a long-distance romance Mr Cousins proposed on New Year's Day in 2012 and the pair married in an intimate ceremony at his home in Hart Hill, Jamaica, in July this year. The reception was also held at the property and Mr Cousins briefly left towards the end of the evening to drop his two daughters back to their mother's house. The new wife and her mother-in-law Dorothy, 80, were chatting in an upstairs bedroom when two thugs burst in and demanded to know 'where is the Rasta?'. They claimed he owed them cash and one of the intruders went in search of valuables. But at that moment Mr Cousins pulled into the drive and the women heard a number of gunshots before the gunmen scarpered. Distraught Mrs Cousins discovered her new husband had been shot in the head and neck. Police arrested two men following the brutal attack, but released them without charge and no one has ever been caught or prosecuted.